Krista and I read somewhere that you should never leave the grocery store without buying lemons and onions. Seems slightly curious to me, but we use lemons a lot for our "house drink," so it usually works for us. - raise heat to 350 degrees, cook an additional 10-20 minutes (depends on the oven) uncovered until chicken is done (I usually baste chicken with sauce a few times during this time). -Toss on toasted sesame seeds after finished in the oven. I got this recipe from a lady that I used to work for who owns and runs the best European-styple artisan bakery in Edmonton, which is called Tree Stone Bakery. I will call her "Nancy," and she is a very serious lady. Serious about bread and, well, everything. And that is part of the reason I no longer work for her. There was an incident I will only now refer to as the "twist-tie fiasco." Anyway, one of the great things about Nancy is that she did know a lot about food, and gave me this awesome recipe which she said is sort of the normal homestyle chicken recipe in the Philipines. The lemon and soy make the chicken very tender. Good served over jasmine rice. 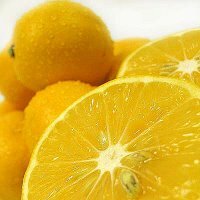 posted by Matthew Francis | 12/05/2005 01:02:00 p.m.
sweet lad, it too seems slightly curious that you've posted a photo of ORANGES while discussing lemons and onions. matthew, i think you MIGHT be colour-blind. look for clues such as shape, little grasshopper, or check with krista. she'll be a reliable helper. hey matthew, that came across snarkier than i intended. they really looked like oranges to me but at second glance maybe they are lemons afterall. last night while i was walking back with miliss and andrea gales, i had no depth perception. i had had alot of coffee yesterday, but does that deprive depth perception?... maybe there was a plank in my eye. i'll have to have a look. the recipe sounds good matt. i enjoy the twist tie fiasco story. it tells of your superhero patience. you were unflappable. Come to think of it, you're right, I think they are oranges! Well, I'm going to keep them up there just to keep people on their toes!